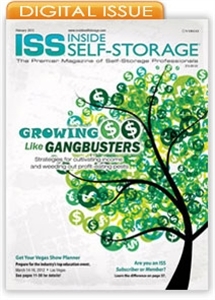 This issue of Inside Self-Storage offers articles on revenue‑generating services and products guaranteed to increase self-storage operators' profit. With self-storage competition at an all-time high, generating facility revenue is more challenging than ever. Operators are not only looking for ways to save but to uncover new avenues for profit. The February issue offers articles on revenue-generating services and products guaranteed to increase operators' bottom line.